Summary: This essay is about the value and importance of sorrow and suffering in human life and how Arjuna's sorrow and suffering and his internal conflict about the justification and the moral aspects of war and destruction led to the revelation of the Bhagavadgita. When Arjuna stood in the middle of the battlefield, between the two great armies, and saw his own cousins and relations standing there in the battlefield on both sides, ready to wage a destructive war, he was suddenly overwhelmed with sorrow and a sense of deep despair. Such moments come in everyone's life. Some people take it quietly, while some become deeply emotional. As a warrior who knew the harsh realities of war Arjuna knew what was going to happen in a war of such magnitude. Any soldier who goes into a war zone to fight knows the risks involved. When you face an uncertain situation, it is difficult to control your emotions and focus upon your task. It is even more difficult, when your actions may potentially hurt others who are known to you or related to you. 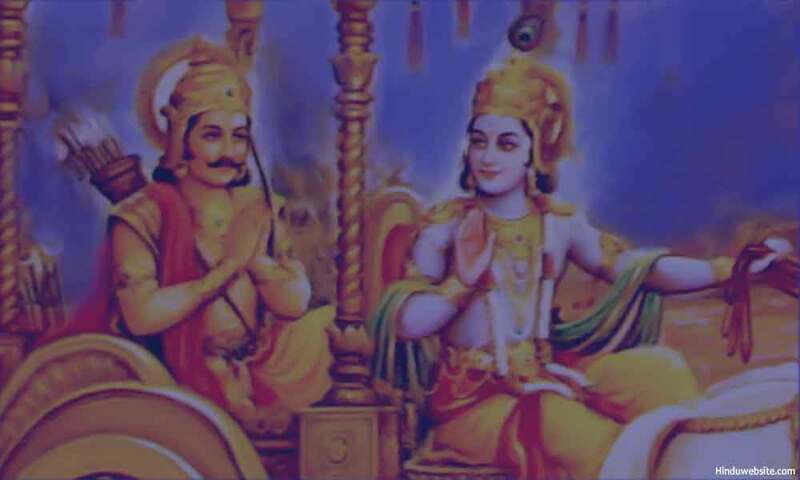 Arjuna was confronted with a similar situation. He was filled with fear and anguish at the thought of the violence and bloodshed which the war might cause, and the possible destruction of his own family members in it. Although he was a warrior of great repute, he did not have the spiritual strength, knowledge or wisdom to fight the war, without subjecting himself to mental and emotional instability. At that crucial moment, he felt that the gains of the war were far less appealing, both morally and socially, than the possibility of suffering and the great destruction that would follow. He became convinced that he was on a destructive course of action and on the threshold of committing a grave sin by causing the destruction of his own family and friends. His reason also faltered as he thought about the consequences, which usually happens when you are in turmoil. He thought that with the destruction of the men in the family, their women would lose their virtue, and from that inter mixture of castes would arise. As he thought about it, he wondered how he could live with blood stained hands after killing them and earning the bad reputation as the slayer of his own family. Would it not be better for him to live on alms like a beggar than killing so many relations and elders of his own family to whom he had always shown respect in the past? Such were the moral and intellectual issues that overwhelmed his mind, as he stood upon the battlefield facing his enemies. Unable to resolve the conflict, in confusion and consternation, he decided to face death, by not fighting rather than kill his relations and living in sin. One cannot blame Arjuna for his reaction as a human being. Like most people, he expressed his confusion, feelings and faltering knowledge. The same thinking and attitude which influence our behavior and reasoning in difficult and critical situations played out in his mind, as he stood on his chariot in the battlefield, with disturbed mind, failing intelligence, weakening courage and faltering judgment. In the face of a grave crisis, he spoke the same way as many people would do when they face similar situations. From the Mahabharata we learn the Arjuna was no ordinary warrior. As an archer, he perfected unwavering concentration. He was a great warrior, who imbibed the beliefs and values of his times, and knew how to remain focused under stress. Besides, he was intensely religious, righteous, friendly, dutiful, earthly, selfless, and humane. When he put down his bow and arrows and sat down in the back seat of his chariot, down and dejected, and refusing to fight, he was not motivated by fear or selfishness or self-doubt. There was neither cynicism nor insincerity nor duplicity in his thinking and behavior. He was genuinely concerned because he knew his strength and the imminent destruction of many people and mighty warriors in his hands because he had superior strength and knowledge of many destructive weapons. His sorrow was genuine, and his reaction was justified. He truly wanted to avoid the war for the sake of others, not to save himself. His fears were also normal and understandable. Whether it was his orthodox views or his genuine concern for the welfare of his family members, or his fear about the virtue of the women in his family, they were genuine and according to the social and moral values of his times. We cannot judge him according to our values and standards. We cannot also find fault with him for his lopsided logic, his inclination to rationalize his fears and his confused thinking about the justification of avoiding the war. He was but expressing the values of his times and the concerns of his conditioned thinking. Worldly knowledge does not illuminate the suffering minds. It also does not help much to resolve the problems of human life, Mental knowledge does not have the force of divine illumination. The human mind, which is enveloped in ignorance and delusion, does not see light without many struggles. The knowledge, which it contains and which is derived from diverse sources through the senses, is an ignorant force, being lacking in clarity, right vision and insight. It does not have the required strength to carry its owner through adversities of life. Being an imperfect instrument of knowledge and intelligence, which is not equipped to deal with the unknown and the uncertain, it does not let see far into future or face life with equanimity and wisdom. As the instrument of nature, it ensnares humans deeply in the pit of their own desires, drawing them deeply into the snare of desire-ridden life rather than leading them toward light and liberation. Its source is not light but illusion. Its purpose is not set people free but hold them involved and bound to the world. It does not let you seek truth but imitate the patterns of nature. Created, nourished and enriched by the senses, it holds in its view a very narrow vision of life, upholding the values that do not seek to mitigate our suffering but increase it, not to show us the way but to lead us astray, not to encourage divine centered awareness but perpetuate self-centered activity. True freedom comes only when humans are willing to break out of the confines of conditioned mind and its knowledge of limited light. Suffering helps them in this process, to tough up, loosen their fears and fight. As long as people do not like to transcend their mind and senses and renounce pleasures and sense-gratification, they remain bound to the world and to the impurities of their minds. In most cases, suffering forces them to change and break free from the habitual movements of the mind. Suffering and awareness of suffering pushes them beyond their comfort zones and fight the destructive and destabilizing forces of life or look for lasting solution to the problem of suffering. Without suffering, it is difficult to think of change or new possibilities and solutions. Sorrow is thus a divine gift which often comes with negative force to shake us out of mental torpor and delusions. Its purpose is to force change and transformation of those aspects of the personality, which keep a person chained to his weaknesses. In most cases, it happens in a rather painful way, as people resist the change and prefer to stick to their self-defeating ways. Thus suffering or sorrow is but the twisted and inverted form of Divine Grace that which in its bosom many precious truths and gems of wisdom. It is a seemingly negative but a truly positive and transformative force, a precursor to enlightenment in whose womb the soul prepares itself for its onward journey. By throwing light directly on the transience and meaninglessness of our existence and by bringing us into direct confrontation with our own limitations and failures, it rather crudely and painfully nudges us towards the loving hands of God. It encourages us to believe in Him, depend upon Him, surrender to Him and seek His help. Thus, suffering is a true and faithful messenger of truth, an instrument of light, which casts a spell upon the mortals, in unpleasant and frightening ways, to wake them up from their pleasant dreams and illusions. It is a teacher who teaches them how to live morally and righteously to stay free from sinful behavior and the poison of karma. It is when you are drenched in the cold showers of suffering that you will find a rare opportunity to cleanse your impurities and become pure and divine. Unless one is burnt in the fire of suffering, spiritual life is but a remote possibility, a distant dream, a mere intellectual debate or delight. The light of God does not shine in the hearts of those who have not shed the tears of hardship. Sincere prayers cannot come from the lips that have not quivered and cried for divine intervention. Devotion does not flow in the heart of those who are not mellowed by the sufferings of life. Along the paths and grooves carved by the hands of sorrow travels the mortal man, through problems and difficulties, into an immortal world that is at once a total negation of all that he has experienced and understood before. In no other way can the mind of man be shaken out of the stupor and the perversion into which it descends. Arjuna suffered, and in the process became wise. He sought divine help and God taught him the song of duty, love, knowledge, wisdom, devotion, renunciation and such other secrets of finding freedom within himself. He revealed to him his immortal celestial wisdom by knowing which he could attain freedom from suffering here and salvation hereafter. Therefore, however distasteful it may be, if difficulties arise one should not try to escape from them. Instead, one should look at as a divine opportunity, the grace of God, or a gift and use it to perfect oneself, gain wisdom or insight, cultivate qualities, or become a better human being. Every suffering that you experience is a spiritual instruction in disguise which comes to you from the Universal Teacher. Suffering is the poison that appears in your life when you start churning it to find the nectar of immortality. Unless you know how to deal with it and absorb it without being destroyed, you cannot progress far on the path of liberation. Even the great gods and the mighty demons had to deal with this poison when they churned the oceans in search of the sweet nectar (amrit) that would make them immortal. When the poison emerged from the ocean and about to threaten the worlds, Lord Shiva came to the rescue. He wholly drank it and kept it in his throat, allowing it neither to go up into his mind nor to go down into his heart. In both situations it would have caused great turmoil and destroyed the very balance of creation and existence of the world. However, Shiva managed it in such a way that it stayed in his throat and kept the worlds and beings safe. Arjuna could not do it. He let his emotions and troubled feeling go into his heart as well as his mind. He was mentally and emotionally disturbed by them and lost his control. Thereby the world in him collapsed. However, in the end his suffering did him good, because of his good deeds in the past and the good karma he earned. It eventually led him to be part of a great, spiritual discourse and witness the birth of a philosophy that would provide solace not only to him but for generations of men and women to come. It brought him to the threshold of the birth of a spiritual river that would flow eternally in the mortal world, and quench the thirst of many a seeker of salvation.